Is the NFL planning to bid farewell to the replay booth? NFL commissioner Roger Goodell says replays could eventually be handled differently. The days of NFL referees retreating to the replay booth may soon be over. Commissioner Roger Goodell told reporters in Dallas that the league is considering a switch to a centralized replay location in the league office, rather than having officials on the field review plays as they are challenged. "Our No. 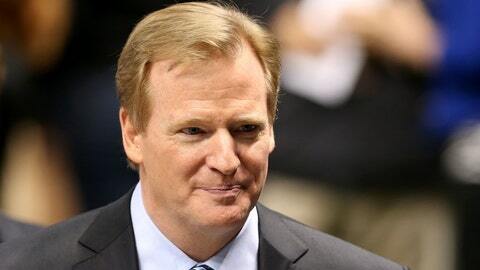 1 focus is to make sure we’re providing the best officiating," Goodell said, according to National Football Post. "We always think we can improve. Consistency is important. By bringing it into the league office on Sundays and having one person actually making that decision you can make the argument that there’s consistency." The report says there is no plan to make the change just yet, but noted that a proposal could be drafted by the NFL’s competition committee to be considered by the league’s owners at their annual meetings next spring. Your home for the latest NFL buzz — on and off the field. Should it pan out, the proposed change to the review protocol would bring the NFL in line with the NHL, which reviews all of its plays out of the league offices in Toronto. In Major League Baseball, the umpires on the field review calls, but must contact the league office to have the play in question shown on a screen. The NBA has referees review plays on a courtside TV, and in college football, all plays are reviewed by a replay official in a booth upstairs. The thought with the NHL method that the NFL is considering is that reviews will go faster because they are being performed by a dedicated replay official, and they will be made more consistently, since there’s one centralized location tasked with reviewing each play. It’s too soon to have any idea whether any of this will actually pan out — but just about anything seems more efficient than the current system. If speed and accuracy are the goal, this seems like a good place to start. • John Madden called RG3’s shutdown ‘baloney.’ BOOM, tough-actin’ Tinactin. • Pete Rose is not pleased with MLB’s decision to ban home plate collisions. • Two agents reportedly fought in the parking lot at winter meetings in Orlando. Happiest place on earth, my behind. • The LA Times has an interesting feature on the differences between coaching football in college and the pros. • According to a report, Eastern Michigan receiver Demarius Reed’s murder was over his clothing and belt buckle. • Fans can vote for the uniform they want Mizzou to wear in the Cotton Bowl. • Check out this neat profile of life as a mid-level bookie.